Dr. Hawkins opens this rare presentation with these words of assurance, leaving us with the feeling of the utmost safety: “God Immanent means the realization of the source of one’s own existence radiating forth as your beingness traditionally called ‘Realization of the Self’….You recognize yourself as the essence of all that exists…Remembrance, you were OK all along. Your survival was guaranteed, because that which is the essence of life has neither a beginning nor ending.” He also discloses the ultimate form of prayer, which is the way in which you conceptualize and contextualize your own existence from instant to instant, like a mudra in which you can pose your existence in the context of Divinity. 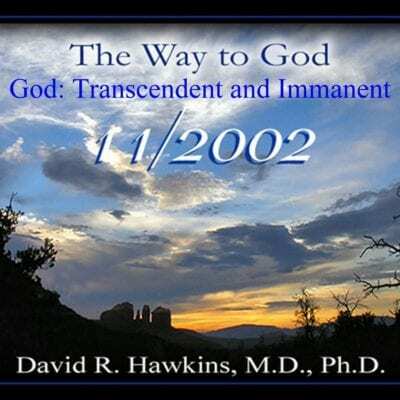 Dr. Hawkins states, “It’s the style in which you are in, out of the awareness of the Presence of God and one’s surrender to be of service to God: that sanctifies all actions. It is by your dedication of yourself to that intention that you sanctify all your actions.” These are just two of the beautiful truths, clarified and expanded upon in this amazing and revealing lecture to add to your collection!